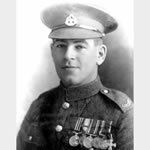 On the night of 1/2 November 1914 near Le Gheer, Belgium, when his officer, the platoon sergeant and a number of men had been struck down, Drummer Bent took command of the platoon and with great presence of mind and coolness succeeded in holding the position. He had previously distinguished himself on two occasions, on 22 and 24 October by bringing up ammunition under heavy shell and rifle fire. Again, on 3 November, he brought into cover some wounded men who were lying, exposed to enemy fire, in the open.